Dynamic new housing with articulate white facades dramatised by curling balcony elements. A new main reception building for this institution specialising in building trades. 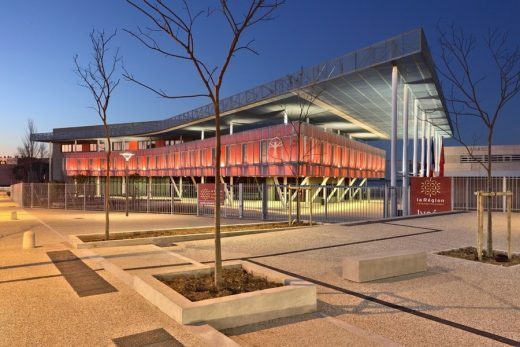 BIG + A+Architecture + Egis + Base + L’Echo + Celsius Environnement + CCVH have been announced winner of the international design competition for the new Cité du Corps Humain (Museum of the Human Body) in Montpellier. The museum’s roof functions as an ergonomic garden – a dynamic landscape of vegetal and mineral surfaces that allow the park’s visitors to explore and express their bodies in various ways – from contemplation to the performance – from relaxing to exercising – from the soothing to the challenging. The architects say this about their colourful new building, “The metaphor of Harlequin’s fabric is obvious, a character that is cherished by the Domaine of O. We redefined this theme to create a light and tangy color and texture. The wood panels cross each other and envelop the volume ; Wood structures the hall as well. Its declinsions avoid monotony, they vibrate and create several rythms and let the red box be seen when necessary”. 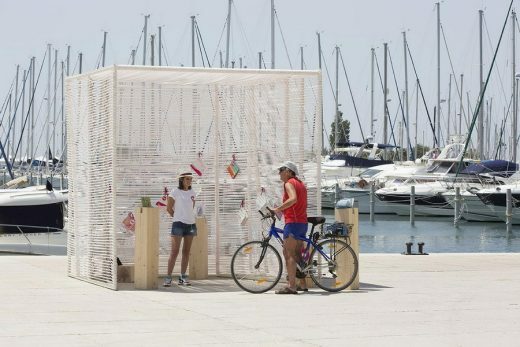 The pavilion, of simple geometric shape, was achieved with the aid of wooden panels. With the massive and opaque origin, the panels are similar to thin sheets of wood embedded into each other. Thus, the pavilion proved sometimes transparent and sometimes opaque depending on the angle preferred by the visitor. This building is based on an historical orthogonal structure and the trace of an ancient and diagonal plot – a boarding school of excellence offering to the children of difficult suburban cities the possibility of a protected scholarship. Pierresvives is situated in France’s eighth-largest and most dynamic city. It has been conceived as an innovative cultural offer, to meet the needs of the area’s significant economic growth and increasing population of over 1,000 inhabitants per month. La Grande Motte city, situated at the edge of the Mediterranean Sea, benefits from a soft and moderate climate. 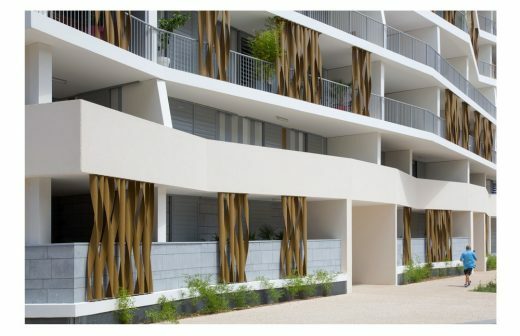 The project of construction of new offices for the technical services of the city of La Grande Motte takes place in a very widely afforested ground. It is a remarkable environment, thanks to the natural elements that surrounds it. So the project testifies of a profound respect for present natural elements while offering a new determinedly contemporary image. The landscape and architectural project presents a strong unity, stemming from the qualities of the place, in order to compose spaces where the environmental quality will be a vector of development.